Rigaku Analytical Devices, a leading pioneer of handheld and portable spectroscopic analysers, will demonstrate its newest handheld analyser for metal alloy analysis at the 12th ALUMINIUM World Trade Fair & Conference (ALUMINIUM 2018) taking place at Messe Dusseldorf in stand #11D62. 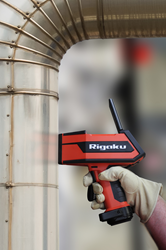 The Rigaku KT-100S laser induced breakdown spectroscopy (LIBS) handheld analyser provides discriminating material identification and validation in different facets of the manufacturing and recycling of aluminium-based products. The trade show is the leading industry event for producers, processers, technology suppliers, designers and engineers from the industries that use aluminium. In addition to the aluminium industry specifically, the trade show and its exhibitors will focus on processes and products for aluminium application industries: such as automotive, engineering, building and construction, aerospace, electronics, packaging and railway. The KT-100S™ handheld LIBS metal analyzer provides on-the-spot identification of the most difficult alloys, including aluminum grades, with lower detection limits and the ability to analyze more alloys. For the aluminum industry, its key strength is the ability to identify light alloying elements, such as lithium (Li), magnesium (Mg) and silicon (Si), which are critical to the positive identification and separation of the most popular aluminum grades. In addition, the KT-100S analyzer offers unique auto surface preparation with its Drill-Down™ feature and is considerably smaller and lighter than other handheld LIBS analyzer currently available. The KT-100S handheld LIBS analyzer is designed to be the ideal analytical tool for use in harsh manufacturing environments and scrap metal yards because of its MIL-STD 810G drop-test certification and IP-54 dust protection rating. Another major benefit to the user is that because the KT Series of handheld LIBS analyzers utilizes a laser excitation source, there is minimal to no regulatory licensing requirements. Product demonstrations, as well as additional information about the capabilities of the Rigaku KT-100S LIBS analyser, are available from the Rigaku Analytical Devices team in booth #11D62, at ALUMINIUM 2018 from October 9-11 or by visiting http://www.rigaku.com/KT100S. Rigaku Analytical Devices is leading with innovation to pioneer a portfolio of handheld and portable spectroscopic analyzers for use in the protection of public health and safety, aid in the advancement of scientific and academic study, enable the recycle and reuse of metal alloys, and ensure quality of key metal alloy components in mission critical industries. Our core goal is to be recognized globally for quality, reliability and expertise in all aspects of our business through our commitment to exceed our customers’ expectations by providing technologically advanced products. The foundation of our company is our talented team, dedicated to continual product development efforts that improve performance and functionality, resulting in reliable, cost-effective solutions for the end user. Our rugged products utilize integrated software that combines an open architecture platform with user defined settings, delivering unparalleled accuracy and extensive application support, empowering our customers to achieve rapid lab-quality results any time, any place.